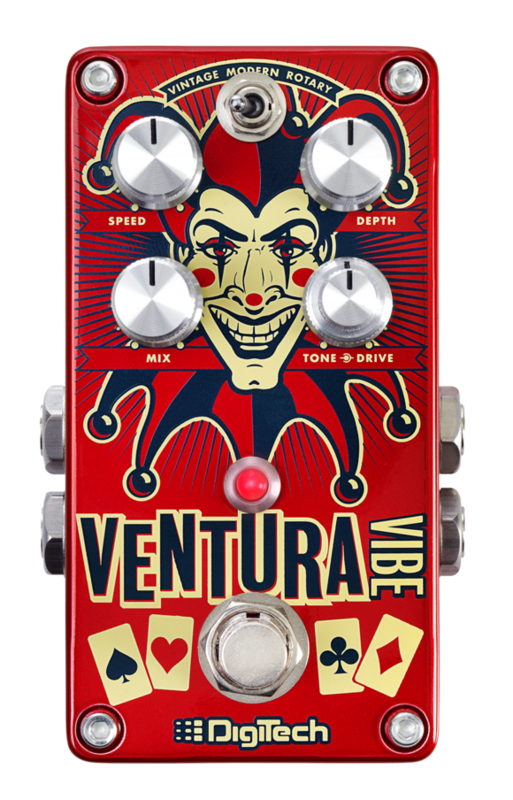 SALT LAKE CITY, Utah – HARMAN’s DigiTech today introduced the Ventura Vibe, putting a few new spins on one of the most distinctive sounds in rock: the hypnotic, swirling sound of a rotary/vibrato pedal. The Ventura Vibe faithfully delivers iconic vibe and rotary effects and ventures into new sonic possibilities with its choice of three effect types, Tone and Drive controls, true bypass operation and much more. “The Ventura Vibe perfectly captures classic phase and pitch vibrato, and rotary speaker sounds made famous on recordings like “Machine Gun,” “Bridge of Sighs” and “Cold Shot” – but that’s just the starting point,” said Tom Cram, marketing manager, DigiTech. “The Ventura Vibe also features a stacked Tone and Drive knob that allows the player to create their own swirling sounds”. The DigiTech Ventura Vibe offers a choice of three modulation types – Vintage, based on the classic opto-coupler phasing type pedal introduced in the 1960s; Modern, a straightforward pitch vibrato effect, and Rotary, designed to emulate the Doppler-effect pitch-shifting sound of a large speaker cabinet with spinning drivers and horns. The Ventura Vibe’s Speed control adjusts the rate of the modulation effects, from a slow sweep to a fast warble. The Depth knob increases the intensity of the effects, ranging from subtle enhancement to vertigo-inducing sonic extremes. The Tone control decreases the amount of high frequencies in the effect signal. Key to the Ventura Vibe’s sonic versatility is its Drive control, which determines the amount of drive/distortion incorporated into the rotary/vibrato effect and which adds body and harmonic complexity to the sound. The pedal’s Mix knob adjusts the amount of the effected signal added to the dry signal. The Ventura Vibe’s dual-function footswitch turns the effect on and off and also controls the speed of the modulation effect via holding down the foot switch – invaluable for going from a syrupy slow sweep to an emphatic fast warble during a live performance. The Ventura Vibe offers mono and stereo inputs and outputs, to create dramatic left-to-right movement and spatial effects when used in stereo operation. The pedal’s additional features include true bypass operation to preserve the tone of the unaffected signal when the pedal is not engaged, a 9-volt power supply, a bright bi-color LED indicator, and a road-tough metal housing. Adding to its usability, the Ventura Vibe comes with DigiTech’s hard rubber Stomplock attachments that fit over the controls to keep the player’s settings in place. The DigiTech Ventura Vibe will be available the last week of October 2015 at suggested retail price of $187.44.